viii+86+[2 adds] pages with diagrams. Small octavo (7 1/2" x 5") issued in red cloth with black lettering and pictorial to cover. Edited and arranged by E Freeborough. 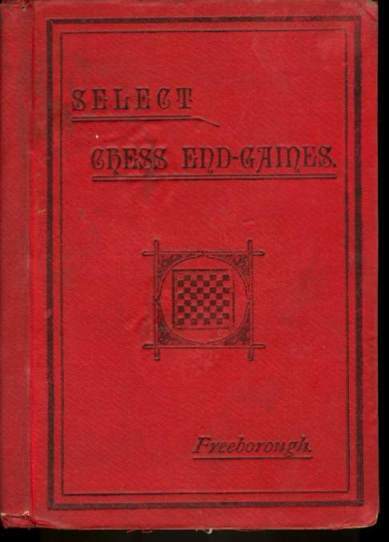 (Betts: 20-1) First edition. Also published New York, New Amsterdam Book Co., 1899. A collection of 87 diagrammed middle and end game positions, each with the winning or drawing continuation. Positions 1-26 cover "assaults on a castled king"; 27-38 deal with attacking positions in which one side has castled on the queen's side; 39-59 are miscellaneous middle and end game positions showing "gaining time to advance a pawn"; 60-76 are mostly end game positions, "pawn play generally"; the final group comprises end game drawing positions. Soiled, corners bumped and rubbed through, some rippling to front cloth, hinges tender with back inner hinge cracked, small bookseller's label on front paste down, some internal soiling. A good copy of a scarce item.